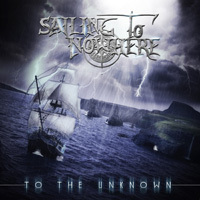 Sailing To Nowhere is a new, upstart, metal band from Italy, recently signed to Bakerteam Records for the release of their debut album, To The Unknown. 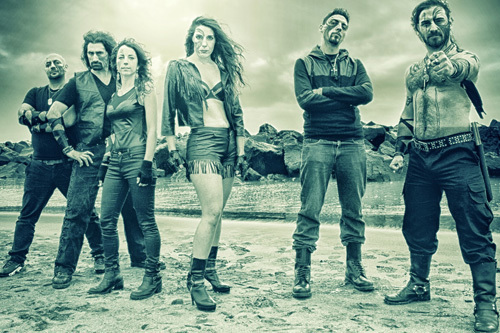 Citing Edguy and Avantasia as influences, you have some clue to their sound: basic European melodic heavy power metal. I'd like to suggest that Sailing To Nowhere is offering something new or novel to the genre, but it's not the case. The band revolves around twin guitars and two vocalists, both male and female. To the former, the guitar work is rather pleasing, offering twin guitar harmony and blistering leads. Definitely a strong point for the band. As to the vocals, not so much. I was put off at the start by male vocalist Marco Palazzi with his coarse sound. My first reaction was simple: this guy can't sing. It's more like he sounds horrible when he tries to stretch beyond his range and becomes screamo. Veronica Bultrini adds some contrast, with a pleasant melodic voice. But she also can get over the top and hard to understand (see Left Outside Alone later). Put the two together as within Sweet Rain, they don't sound to bad at the start. Then Palazzi tries to raise his voice. It's nearly painful. Perhaps he's an acquired taste, just not my taste. (The guitar work in the song is quite cool.) After this there's some embellishment from keyboards, sometimes for a symphonic effect as with Big Fire. The piano and mock orchestration at the start of Sweet Rain is also quite nice. And, generally, the song composition is well-rounded with good melody and harmony, fine pacing, and solid contributions from each player (excepting Palazzi). The band does a cover of Anastacia's Left Outside Alone, a major hit in the European theater. I've never heard the original, as I don't listen to that modern pop dance diva crap, so I can't say if this is a fair rendition. Suffice to say, Bultrini's vocals don't do the song much justice, sounding strained and screamo. Nevertheless, for basic European melodic power metal, and obviously talented, Sailing To Nowhere is on the right path for the genre. They just need to find something that sets them apart from the massive amount of other bands doing the same damn thing. For basic European melodic power metal, and obviously talented, Sailing To Nowhere is on the right path for the genre. They just need to find something that sets them apart from the massive amount of other bands doing the same damn thing.